Rugelach - Do You Know The Muffin Man? Notes: Shh, I have some overdue cream cheese that's been sitting around in the fridge for too long, some chopped pecans taken home from cookie class a few weeks ago, a jar of jam that I'm trying to get rid of, and leftover chocolate that's been melted and re-tempered countless times. What to make? 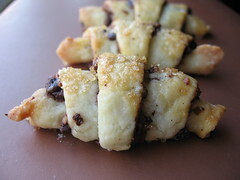 Why rugelach, of course! The sugar-free dough is extremely easy to make in the food processor and rolls out easily. I spread the dough with açaí jam: it doesn't taste all that interesting to me, so I was glad to be able to use some of the jar up. These cookies were very tasty, featuring a rich, tender dough, and a yummy filling. Since they're small, it doesn't seem all that fattening to eat one (or two). Greenspan has a detailed blog post about rugelach.